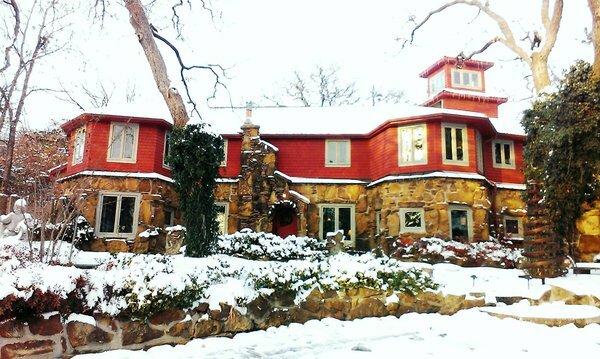 The beautiful Cedar Rock Inn at Redberry Farm in winter. Break free from post-holiday blues and make a resolution to brighten the colder months with a fun winter getaway in Oklahoma. Come along on a 48-hour winter adventure and explore Oklahoma’s natural beauty in a different light, warm up with some of the best comfort food around or discover the state’s fascinating history and culture. With chilly winter winds keeping many nature lovers indoors, Alabaster Caverns State Park offers the perfect chance for outdoorsy folk to escape the elements during daily guided tours of the park’s natural gypsum cave. These invigorating ¾ mile tours of the cave’s incredible formations will satisfy the urge to explore while keeping the icy winds at bay. Drive a short 30 miles down the road to Waynoka and stop at the Waynoka History Museum & Information Center. Located in a Santa Fe depot next to the famous Harvey House, this lovely museum offers a fun and fascinating look into Waynoka’s history as a transportation hub. For a quick dose of outdoor splendor, head to Little Sahara State Park’s impressive observation desk for 360 views of the local sand dunes. Head over to the corner of Cecil and Church Streets in Waynoka to enjoy a hearty, soul-warming meal of Bavarian delights at Café Bahnhof. This charming eatery features German favorites served up in a cozy and welcoming environment by the always-entertaining proprietor Dieter Dorner. Start out with a warm pretzel with mustard before moving on to filling entrees like Jaeger Schnitzel with potatoes, Forelle (pan-fried rainbow trout) or grilled lamb chops with cabbage. Wash it all down with a full-bodied German beer. After satisfying your appetite, saddle up for a quick 20-minute jaunt to the nearby Newton Ranch for a cozy stay at the magnificent Gloss Mountain Outfitters. This stunning property houses the Cedar Haven Lodge, a 10-person getaway surrounded by a tree and mesa-lined valley. After breakfast, make your way out for a lively morning in charming Alva. From there, take a stroll through downtown to Holder Drug for some fun, seasonal shopping. You can also take a self-guided tour of Alva’s many murals. These gorgeous public artworks, commissioned from several talented artists from around the country, tell the fascinating story of the town of Alva, as well as Oklahoma’s pioneer era. Take the tour in your car or brave the cold for some snapshots of these memorable landmarks. Once it warms up a bit, make your way to one of Alva’s cutest attractions. The Menagerie: Bradt’s Mammals & More is a family farm and special kind of zoo that encourages interaction with traditional farm animals like chickens, ducks, goats and sheep as well as more exotic animals like llamas, highland cows, alpacas, zebras, emus and many more. Kids and adults alike will love this fun walk on the furry side. Hop in your car for a scenic afternoon trip to Enid. Once you arrive, head downtown for an adventure along the Chisholm Trail at the Cherokee Strip Regional Heritage Center. This award-winning museum highlights the pioneer experience with interactive exhibits and living history events. If you’re itching to for some retail therapy instead, head to Enid’s exciting shopping district filled with lovely antique stores, unique gift shops, quirky boutiques and much more. Exploring is hard work, so reward yourself with some mouthwatering comfort food that warms the body and soul at Callahan’s Pub & Grille. Start out with a scrumptious Scotch egg before feasting on a hearty, authentic Shepherd’s Pie, a piping hot bowl of savory soup or a perfectly prepared steak. After your well-earned meal, head to Southard House B&B in Enid’s Kenwood Historic District for an enchanting evening stay. Each of their four luxurious suites has something unique to offer from antique, claw-foot tubs to canopy beds and bay windows. For a scenic start to your Tulsa-area adventure, make your way to Keystone State Park on a Friday evening and check in to your cozy park cabin. Each of the state park’s 20 cabins feature fireplaces, which are perfect for a relaxing winter evening. A few of the cabins also feature Jacuzzi bathtubs, so reserve your cabin early for the full, luxurious experience. Have an invigorating and uplifting start to your day with a brisk hike through the nearby Keystone Ancient Forest. This amazing nature preserve showcases trees up to 500 years old and a bevy of migratory birds that winter in the area. Note: Keystone Ancient Forest is only open for hiking on select Saturdays, so plan ahead. After your exhilarating jaunt in the crisp winter air, warm up with a short drive to nearby Tulsa and enjoy a filling lunch at Ike’s Chili House. This Tulsa institution is the city’s oldest restaurant and for good reason. While they’ve occupied various locations around Tulsa, this local institution has been serving its “chili for all seasons” since 1898. Try it in on a burger, a Frito pie, a hot dog with chopped onions or as a “three-way” with spaghetti and beans. Follow up your lunch with a stroll through the Blue Dome Entertainment District, stopping off at some of the unique shops featuring plenty of fun and quirky Made in Oklahoma apparel, décor and furnishings. The Cedar Rock Inn, located just minutes away from Blue Dome, is the perfect place to rest up from your day. Nestled among 65 acres of foothills west of Tulsa, this completely restored and renovated 1890s home is a luxurious getaway like none other. Each of the five suites is uniquely themed and you’ll want to explore the tastefully appointed common areas as well as the surrounding grounds while there. If you feel like going out for your breakfast, you can’t miss with The Bramble Breakfast & Bar, located right around the corner. The Bramble features a short-order breakfast made with locally sourced and seasonal ingredients. Try the “piggies and eggs,” migas or Eastern European favorite khachapuri, a pull-apart bread filled with cheese and eggs. Before leaving Tulsa, get a dose of culture at one of the city’s premier museums. For explorations in fine art from all over the world, visit the gorgeous Philbrook Museum in southern Tulsa or its satellite location in the downtown Tulsa Arts District. If you’re more of a music fan, visit the Woody Guthrie Center, which features interactive exhibits, photography, documentaries and much more. Kick off your two-day winter getaway by centering yourself for the coming year at the one-of-a-kind Turtle Rock Farm in Red Rock. This amazing agritourism destination is a secluded retreat focused on personal improvement and sustainable living. Relax and reconnect with the natural world with the many activities available at Turtle Rock, such as hiking the grounds and mingling with the farm’s variety of animals including alpacas, pygmy goats and chickens. Enjoy a massage or join one of the many classes on simple living, sustainability and meditation. Head into nearby Tonkawa for an exciting dining experience at the unique farm-to-fork destination, TS Fork. Not your normal neighborhood joint, TS Fork serves up five-course, prix fixe dinner menus every Friday and Saturday. Menus rotate every other week in order to highlight seasonal produce selections, as well as locally raised lamb, beef, chicken and pork. Make reservations in advance to make sure you have a seat at the table. On the way back from Tonkawa, stop by the Heart in the Park Labyrinth, a little gem of a roadside attraction. Located in a downtown park, this heart-shaped structure is a symbolic tribute to Tonkawa’s history and contains pathways that lead visitors along a timeline pathway through the town’s fascinating past. Head back to Turtle Rock Farm for a night in Straw Bale Hermitage, a hand-built adobe cottage, or for a more adventurous stay, stay in one of the retreat’s sizable teepees. Make your reservations in advance and ask about their retreats and special winter events. Rise and greet the day by heading to Tonkawa to feast on mouthwatering breakfast omelettes from the legendary Mary's Grill. Choose combinations of meats, cheeses and veggies, or go with the smothered chicken fry, pancakes and cinnamon rolls. After fueling up, drive to Ponca City to see one of Oklahoma’s premier architectural attractions. The Marland Mansion & Estate was built in the mid-1920s for oil magnate E.W. Marland. Modeled after Florentine villas, this spectacular structure contains over 43,000 square feet in 55 rooms. Take a guided tour to hear fascinating details about the house’s construction and the curious history of the Marland family. If you’re craving barbecue for lunch, visit the famous Danny’s BBQ Head Quarters, home of Head Country sauce, for a mouthwatering carnivorous feast. Or, if you’re in the mood for a hearty sandwich or hot bowl of soup, you can’t go wrong with a visit to the Rusty Barrell Supper Club, which also happens to have the most extensive salad bar in town. After lunch, visit the Pioneer Woman Statue and Museum, one of Ponca City’s most important landmarks. Both the iconic bronze statue and the accompanying museum are tributes to the legacy of women of all races and nationalities who have contributed to Oklahoma’s development. If time allows, stop by and take a tour of the historic Poncan Theatre. With a gorgeously ornate interior, elaborate ceilings and stained glass, this theater is one of the few remaining examples of “atmospheric” theater design. Make sure to browse the incredibly rare collection of hand-painted lobby art from 1930s films as well. From Ponca City, drive east to Pawhuska. If you’re hungry after a day of exploring, try a delicious gourmet hot dog at local favorite The Prairie Dog. Or, if you skipped barbecue earlier in the day, head to Bad Brad’s Bar-B-Q Joint. Once there, try the Trail Boss sandwich with your choice of brisket, Polish sausage, hot links, bologna or pulled pork smothered in sauce. After dinner, check in to one of the eight cozy cabins at Osage Hills State Park, a popular destination for hikers, bikers, fishermen and birdwatchers. A stunning example of Oklahoma’s natural beauty located on the outskirts of Pawhuska, this state park will ensure a peaceful and comfortable way to end your getaway.